Daytona debutant and 2019 Sunoco 240 Challenge winner Kyle Reid capped off a superb weekend by not only starting the four-hour BMW Endurance Challenge race at Daytona but taking the chequered flag as well. Cheered on by friends and family, Kyle qualified the Fast Track Racing / Classic BMW Sunoco-liveried M4 GT4 during Thursday evening’s 15-minute session, clocking a time of 1:55.287, 22nd overall, and third fastest BMW driver on the 49-car grid. Making up four places in the opening two laps of the race, the Mini Challenge Cooper Pro Champion kept things steady before pitting during a full-course yellow at the 45-minute mark and handing over driving duties. Sound strategy meant the car led the race at half distance, but unavoidable contact with a spinning Audi cost the outfit six laps as repairs were made. Further misfortune befell the team as a puncture necessitated another stop, though this provided Kyle with the chance for a final stint to bring the car home to the flag on his Daytona debut. Despite a 30th place finish, the team was just a moment of misfortune away from what could have been a spectacular result. “I’ve loved everything about it,” said Kyle. “The start of the race was something else, going into turn one with 49 cars on the grid. In every mirror there was a car, so I just picked a line and managed to get through. I made up four places and then handed over to Jayson [Clunie]. “The car was leading at one point, but we picked up some damage when Toby [Grahovec] had contact and it lost us six laps, but it meant I was able to get back in the car to take the chequered flag which was special. “Kyle did exceptionally well, considering he came from a Mini Cooper and we placed him in a completely alien environment with 31-degree banking and a BMW M4 GT4 race car that is four times the power and rear wheel drive,” said Anders Hildebrand, Anglo American Oil Company Managing Director. 2019 Sunoco Whelen Challenge winner Linus Lundqvist completed his debut appearance at the Rolex 24 At Daytona, despite some of the most extreme conditions the race has been held under. With torrential rain arriving at the circuit through the night, the contest was red flagged twice – for the first time in its history – when conditions deteriorated. Linus drove the Precision Performance Motorsport (PPM) Lamborghini Huracan GT3 EVO masterfully despite competing in single-seaters last year, and the BRDC British Formula 3 Champion was immediately on the pace during the race and able to hold his own amongst factory-backed professional drivers in other GTD-class cars. After a busy autograph session and driver and car presentation on Saturday morning, Don Yount, who qualified the car, climbed back behind the wheel at 14:35, for the 57th running of the Rolex 24. Linus suited up after the opening two stints and completed a significant career milestone, his first racing laps around the 31-degree banking of Daytona International Speedway. The current BRDC British Formula 3 Champion was immediately on the pace and able to hold his own amongst factory backed professional drivers in the other cars. Completing a double stint with no problems, Linus returned to the pits and handed over to his colleagues. Unfortunately, the car stuck in gear at around 22:20 and had to be towed back to the garage. A faulty clutch was identified and the team worked swiftly to replace the part, returning to the track just three-and-a-half hours later. Getting back onboard the car at 06:00 on Sunday morning, Linus could only circulate behind the Safety Car before the race was red flagged almost 90-minutes later. After this point there was little action on track as any racing laps were quickly curtailed by incidents and yellow flag periods before once again being halted at 13:00 and called for good 15 minutes before the 24 hours were due to expire. The final results show that after a trying debut for Linus and the team at PPM they were classified 20th in class but most of all, after everything that had been thrown at them, they finished the race which, given the extreme conditions, was a result in itself. “My first 24-hour race is complete,” said Linus. “It’s maybe not the way I would have wanted it to end as I only got to do one double stint and the rest of the time was spent behind the Safety Car. We had an issue with the clutch, but the team did an incredible job to fix it and I’m really happy with the way the guys came together so a massive thanks to them for that. “It’s the tenth year of the Sunoco Challenge and it’s incredible when you look back and see the kind of winners we’ve had,” said Anders Hildebrand, Managing Director of the Anglo American Oil Company. “What’s amazing is that every year our winners do so well and never put a foot wrong in extremely difficult conditions. 2019 Sunoco Challenge winners Linus Lundquist and Kyle Reid are set to make their racing debuts at the world-famous Daytona International Speedway this weekend (January 24-27) for the Rolex 24. Having taken part in the Roar Before The 24 earlier this month, both have now turned their first laps around the 31-degree banking and challenging infield course, but this weekend will be the first real test, with practice, qualifying, and the races held over three packed days. 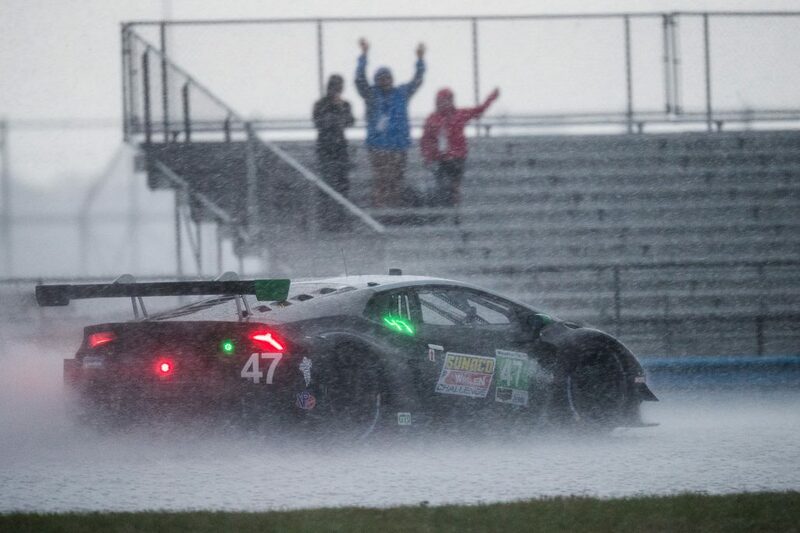 Linus Lindqvist battles torrential rain in the #47 Precision Performance Motorsports (PPM) Lamborghini Huracan GT3, GTD at the 2019 Roar Before the Rolex 24. Linus, making Sunoco Whelen Challenge history as the first winner to climb aboard a car in the competitive GTD class of the Rolex 24 At Daytona, will be carrying the flag for the BRDC British Formula 3 Championship as reigning Champion. He will have just under two hours of practice in which to acclimatise, while sharing his Precision Performance Motorsport Lamborghini Huracan GT3 Evo with three other teammates, before qualifying takes place on Thursday afternoon. Kyle Reid takes to the famous 31-degree banking in the #26 Fast Track Racing/Classic BMW M4 GT4 in the 2019 Roar Before the Rolex 24. 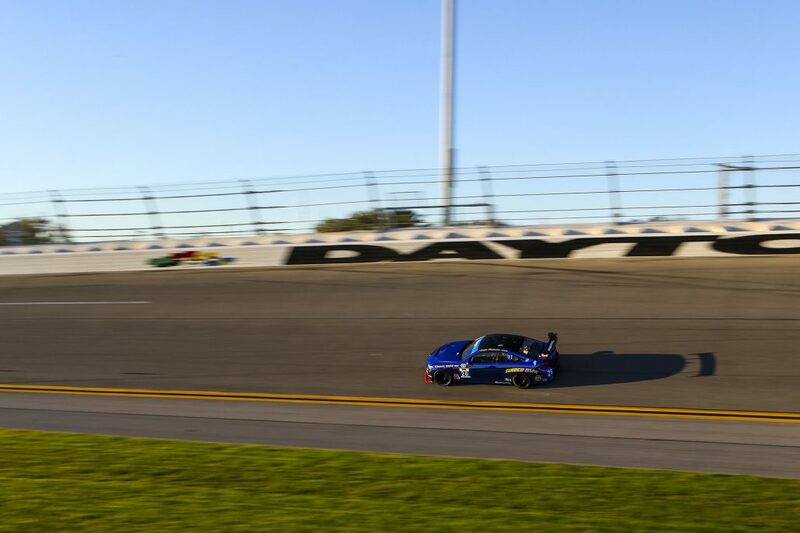 Kyle, the latest Sunoco 240 Challenge winner, represents Mini Challenge as the Cooper Pro class Champion, and will be competing aboard a Fast Track Racing/Classic BMW M4 GT4 in the BMW Endurance Challenge At Daytona, branded in the classic Sunoco blue colour scheme. Like Linus, Kyle will also have around two hours of track time, shared with his teammates, before qualifying later on Thursday. “We did a few laps and felt more comfortable in the car during the Roar Before the 24. It was interesting to see our rivals’ speed and compare where we stand. The circuit is not too technical, but it is a learning process with the team and how endurance racing works, so we’ll see how things unfold. 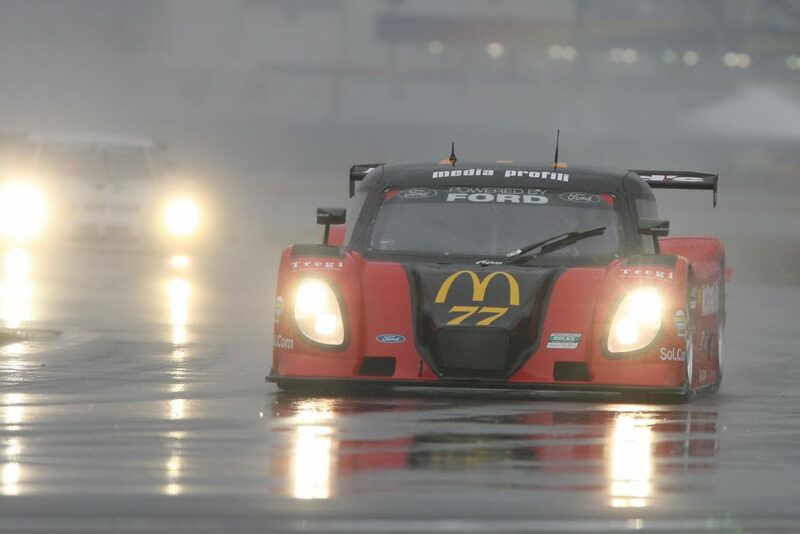 “It was an awesome experience at the Roar Before The 24. The guys gave me an opportunity to do a qualifying run in practice so hopefully I get to qualify the car for the race itself. It was a great learning experience with a new team, new track, and new car. I felt I improved every session and the team were happy with me. With the 2019 Rolex 24 at Daytona rapidly approaching, the Anglo American Oil Company (AAOC) is celebrating two key milestones with its successful Sunoco Whelen Challenge. This year is not only the tenth in which the winner of the Challenge will receive a drive in the prestigious 24-Hour contest around Daytona International Speedway, but also the fifth in partnership with Whelen Engineering, which funds the seat thanks to the generosity of owner Sonny Whelen. In recognition of the generosity of Sonny, AAOC makes annual donations to the Michael J. Fox Foundation, though its Team Fox fundraising platform. The Foundation is dedicated to finding a cure for Parkinson’s disease through an aggressively funded research agenda and to ensuring the development of improved therapies for those living with Parkinson’s today. “Parkinson’s is an incurable degenerative brain disease,” said Sonny Whelen. “When you have Parkinson’s, the cells in your brain that create dopamine start to die off. That dopamine is basically like a grease for your car. Without it the wheels, the hinges, are going to get tight, and not move as well. You end up a bit like the tin-man in The Wizard of Oz. 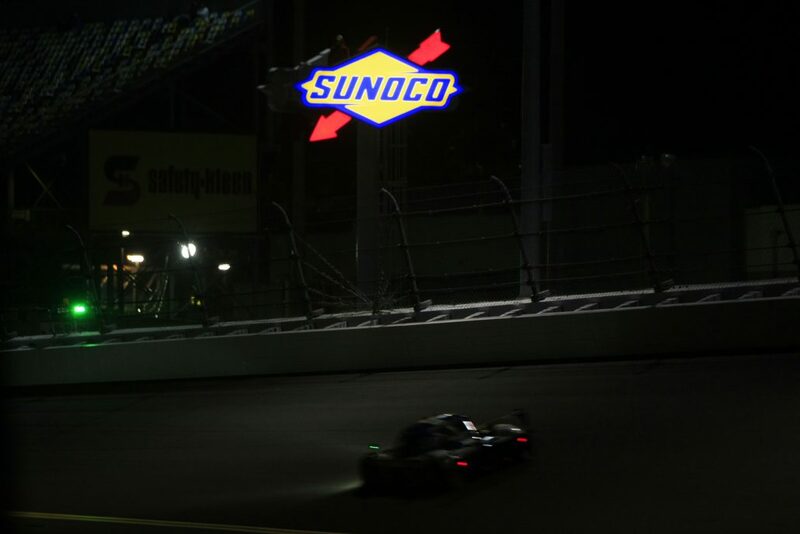 Felipe Nasr races past the Sunoco sign in the 2012 Rolex 24 At Daytona, en route to third place.